Step #1 - Make a game plan. The 63.5k Great Walk and Ultramarathon is a race that stretches from Gold River to Thasis along the "Tree to Sea" Highway. 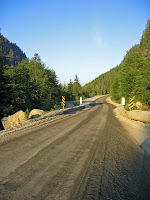 The highway, as it turned out, was about 40% paved and 60% gravel. 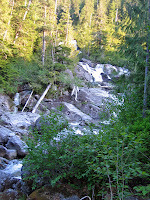 Along the route, one will be witness to amazing waterfalls, lakes, trees and multiple clearcuts. 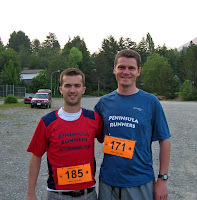 This was one of my big races for 2009. With the distance being 63.5k, it would be my second longest run ever. Races like this require careful planning and ample training if one is to be successful in even finishing it in one piece. My partner in crime for this event was my buddy Myke LaBelle. At 22 years old, he has huge potential in the world of ultrarunning as his speed, distance and training are all impressive. As great as it was to have him along for the ride, I knew that my experience was superior to his. We both knew somehow that if we could find a way to work together using all of our strengths, it would be a good race for both of us. It was a Friday afternoon, and I had just finished work. I picked up Myke shortly thereafter and we were on our way. We made it to Boston Pizza in Campbell River by 5:30 pm and looking at the menu, we took about 10 seconds to decide our pasta choices. 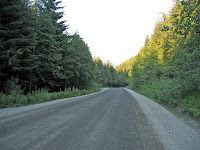 Dinner was over quickly, and we were now on the road once again and in pursuit of a quick ride through Strathcona Park to Gold River. 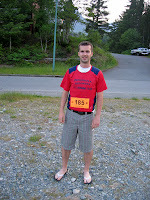 In Gold River, we followed the signs to the Great Walk registration and sign-in, and picked up our packages. The organizers were great and it appeared that they had a pretty good drop-bag system in place. However, Myke and I both stuck to our original plan to carry our Nathan Hydrapaks with us along the race. I simply had to have the safety of my hydration with me over a course of this length. We decided that while it was still light out, we would go for a drive along the course and check out what the terrain was like. More specifically, we were interested in checking out the first 13k of the road, which was supposed to be somewhat of a brutal climb. The road looked to be in good condition. It had been recently graded and also watered or oiled to keep the dust down. The hills on the road however were a different story. They were fairly significant. After that drive, Myke and I made a race plan. We decided we would walk all the uphills of the first 13k and run the flat sections only. This strategy, we felt, was paramount in our success if we were to last and be strong for the entire 63.5k distance. We returned back to the parking lot and the next little while was spent getting our gear all set up, and also our sleeping arrangements. The plan was to sleep in the back of the car, as there was little point in getting a hotel room when we had to be on the start line shuttle bus by 2:30 am. The last time I had slept in my car was probably when I was 22 years old. We got to bed around 10 pm and I spent the entire night spooning the wheelwell. Oh the joys of running. It wasn't a great sleep, but I figure I got probably 3 hours. This would be more than many people who just decided to make it an all-nighter. Race morning was a dark one and both Myke and I were thankful for having brought our headlamps. We got our gear and headed for the 2:45 am shuttle to the start line. Why the shuttles left so early for a 4 am start time I'll never know. At the start line, we spent the next hour chatting with the few people we knew there. It wasn't too cold, thankfully, and the conditions looked to be perfect. Myke and I joked about doing some formal warm-up like a couple sets of A, B, C's or 5 minutes of continuous burpees, but we were simply happy that the race started right on time. Myke let out a few boyish screams as the race began. As we approached the first hill, the game plan now began. We simply stopped, walked and watched a few hooligans run by us up the hill. That pretty much was the plan over the first 13k. Everytime even a little hill came our way, we speed-walked up it. We also stuck to a regime of slowing down every 1/2 hour for nutrition and hydration. I was doing 1 gel and 1 S-Cap every hour, while Myke was gelling up every 1/2 hour. While I thought that was alot, he told me that the winner of last year's Hardrock Event in the States went through 80 gels. Unbelievable. The first two guys to pass us meant business. One looked younger and one looked older, but they certainly ran out of sight pretty quickly. We could see their light ahead of us disappear into the darkness pretty quickly. Although it was certainly tempting to keep the leaders in sight, I was content with our plan, and still thought that in the end, we would be catching people. A wise ultrarunner once told me, "It's not how well you run the first 10k, but rather, how well you run the last 10k of an ultra." Around the 6k point, we were passed by a female runner, who looked like she had done these types of races a few times before. She smiled and turned to us and asked us what time we were expecting to get. Myke told her "5 hours" and inside I was fairly shocked. I then thought while Myke may be making that time, I certainly am just looking for a slow and steady race. I hadn't even really thought about a specific time. Myke certainly had. The female runner ran by us and continued a steady pace up the climb. She was running, and we were mainly walking. Shortly thereafter, I thought it was now light enough to put our headlamps away. By the top of the first climb (13k - 1300 ft.), we reached Aid Station #2 and Myke and I were ready for the second part of our plan. My watch read 1:40. He asked me if I felt tired at all, and I said no. It actually just felt like a decent warm-up so far. Myke felt the same way and he was now like a caged bull ready to be released from his cage. At the Aid Station, Myke asked the volunteers how far the leaders were infront and they told us "20 minutes." I could tell Myke was not pleased by this news, but he tore off after them. I followed. I figure at this point, we were in about 8th and 9th place. The fact of the matter is that it would have been stupid for the two of us to run together, and we knew it. If we did run together, I would be pushed at a higher pace that what would be comfortable to me, and although I could probably hang with him for quite sometime, I know I would suffer severely for the last 20k or so. If he were to slow down and hang out with me at my pace, it would just be uncomfortable and frustrating for him. The pacing in these things is so important, as ultra runners want to ensure that they stay in their own personal efficiency zone. So off we finally went on our own separate paces. It didn't take long for Myke to disappear from my sights. The course was now mostly flat or downhill and he was clearly making the most of his young legs on the downhills. I immediately passed two small groups, and now I knew I was in 5th place. I was now going at a pretty good clip. I knew that I had to use my long stride down the downhills to make up any ground on those leaders. Myke and I had joked about possibly finishing 1,2 in this race, but that would certainly be nearly impossible with those leaders so far ahead, and showing no signs of weakness. As nice as it sounds to tell people they were many downhills in this race, some of the downhills were barely runnable. Many of the hills were preceded by those road signs that warn motorists of the steep grade (16%, 18%, 19%). In addition to this, many of the steep hills were paved in an effort to make winter driving on those steep hills less formidable. All this meant that for someone of my position, I really had to be cautious on those steep downhills. I certainly could not run the risk of reinjuring my knee. That really would be the end. At around the 18k part of the course, dense fog crept in and it was a pretty cool feeling. Literally. The small fog droplets on the face felt so good. And then, I saw someone infront of me through the fog. It was the female runner, and it looked that she too was not a big fan of the steep downhills. She was even going slower than me on them. I spent the next 5k or so flip-flopping with her. I would pass her on the flat or down, and then she would pass me on the uphills. I continued to conserve my energy by walking up every uphill, while she continued to run up them slowly. However, I would eventually drop her, and now I was once again on my own. Running in the middle of nowhere. Shortly thereafter, I saw a road sign that said "Thasis 40". Wow I thought. Only 1 marathon to go. This was definitely a long distance for me. I didn't see a whole lot for quite sometime in the race (20-30k). The odd aid station would be a welcome sight in what was a pretty non-eventful section. Nobody seemed to be around me in the race at the moment. That was until a pick-up truck drove by me and stopped ahead of me. The lady waited until I ran up and then she said that I had to be careful because there was a very large black bear just off the side of the road just ahead. Great. Briefly I considered stopping, but felt I should plough along and just make alot of noise. I clapped and sang out loud for the next 100m or so, with no apparent bear sighting. And although it is always so cool to see a bear, you really do not want to see one when your only defense mechanism is to squirt a gel at it. So now I was approaching Aid Station #6. I had now gone just slightly more that 1/2 way. This was a major checkpoint and you have to stop and get your race number punched here to earn the coveted race shirt at the end of the race. Because I was totally curious, I asked where Myke was in the race right now. They told me he was in 3rd place, but right behind the leaders. I was excited for Myke. For me though, I had succumbed to the fact that I likely wouldn't be seeing any of them until the finish line, and I was totally fine with this. My goal was to remain steady and race my own race here. Once again, the next 10k or so was relatively uneventful for me. No bear sightings, no other runner sightings. 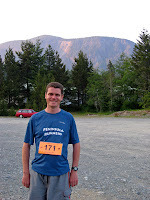 My pace remained steady and the only joy I really had was asking each of the Aid Stations where in fact Myke was. Aid Station #7 had told me that Myke was now in 2nd place, and then Aid Station #8 told me Myke was now in the lead. God I was happy for the guy. But it wasn't over yet - there was still around 20k to go. I was feeling reasonable for this point in the race. Sure, my legs felt heavy, and I had fought off a couple very slight cramp tweaks in my legs, but now the volunteers at the aid station that there was a big uphill about to come. Big uphill was right. I took on the powerhike in fine form, and thought as long as everyone else is walking through this section, nobody will be passing me. I took the odd glance around my shoulder and still there was still nobody in my rearview mirror. I now made it to the next aid station at the top of the hill. I felt like crap now. As good as the powerhike was, it must have sucked all my energy out. 50k down, 13k to go. I reminded myself how close I was to the finish - it really wasn't that far, was it? I actually thought I could probably just walk it in from here and still finish top 10, and under 7 hours. The next 6k was flat, but proved to be a real struggle. I still felt like crap and was now even walk-running, with the emphasis on the walk. I was certain I would be passed now, as I think I saw a slug pass me. However, as luck would have it, nobody did pass me and the gel/S-Cap combination seemed to kick in right as some downhills appeared on the course. Perfect. I definitely could run these downhills, and my energy was temporarily back to normal. I checked my watch again at the next aid station, and I now had a new motivation in place. I figured out that I could get under 6 hours if I was able to hold off any major cramping episodes. But this would not be easy. My body was pretty wrecked. The next aid station informed me that Myke was now well ahead and that unless he completely fell flat on his face, that he was going to win. Awesome. Totally awesome. And, I am proud to say, I ended this race in decent form. The last few k's were pretty good. I ran the majority of the last 4k, and I knew now that I had 4th place under wraps. My time was also going to be close, but I think I had it. As I rounded the bend into Thais, I knew I had the finish now as the last adrenaline rush kicked in. I rounded the bend by the fire station and then heard a big fire truck sound it's siren. People who lined the streets were clapping and cheering for me. One lady rang a cow bell. What an awesome feeling. I now saw the finish line and heard Myke cheering for me. I had this thing. I crossed the line at 5:55, and in 4th place. Myke would have a superb day as well and take the win in a time of 5:13. Myke's win aside, I was extremely pleased with my performance. I thought the game plan of walking most of the first 13k worked out absolutely perfectly for both he and I. This was the second longest distance run I had ever done. My training mileage never went above 60k per week, and I still pulled it off. I ran when I could run, I walked when I thought I should walk, and I fought off several near cramping episodes. 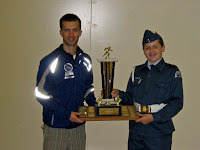 I ran a strong physical and mental race. If someone told me that the two of us would finish both under 6 hours, I would have been ecstatic. And now I am. Great account of the Great Walk. Brings back memories of the year Bob and I did it. Those types of runs are such a great adventure ... although once was certainly enough for me! Thanks Rob. Next time I am passing through CR, I'll phone you for the pasta fest.